Emmett, who was carrying the money bag, tried to mount his horse but was hit in the right arm, left hip, and groin. He then rode back for his brother Bob, and as he reached down for him, Carey Seamen unloaded both barrels of his shotgun into Emmett’s back and Emmett dropped to the alley. Emmett then held up his uninjured hand and surrendered. He was taken to Dr. Well’s office with 20 bullets and the doctor said he would be dead before nightfall. However, 21-year-old Emmett survived. The entire gun battle had lasted less than fifteen minutes after the robbers had entered the banks. Eight men were dead and three were wounded. In addition to the four outlaws who were killed, the local men that were killed were Marshal Charles Connelly, Lucius Baldwin, George Cubine, and Charles Brown. Emmett stood trial and was sentenced to life in prison. However, due in part to his friends on the right side of the law who thought he was not beyond redemption, Emmett was pardoned in 1907. On September 1, 1908, Emmett married Julia Johnson Gilstrap Lewis in Bartlesville, Oklahoma where they lived for a couple of years before moving to California. In California, Emmett worked as a building contractor and later would write a book about the exploits of the Dalton Gang entitled “When The Daltons Rode.” Written in collaboration with Jack Jungmeyer, a Los Angeles Newspaperman, the book was published in 1931. In May of 1931, Emmett and Julia returned to Coffeyville for a visit, where they were treated like celebrities. Emmett died at home in Long Beach, California on July 13, 1937. 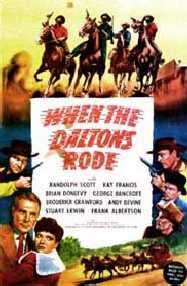 In 1940, shortly after Emmett’s death, the book was made into a western movie starring Randolph Scott, Broderick Crawford, Andy Devine, and Kay Francis. Julia Dalton was associated with the filming as a sort of technical advisor. Later, she went to Coffeyville, Kansas, for the picture’s premiere. Coffeyville was not the end of the Dalton Gang. 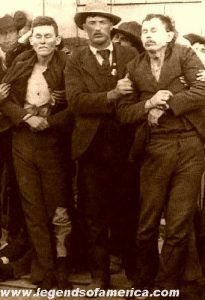 Three members of the old gang remained at large; Bill Doolin, Bitter Creek Newcomb, and Charlie Pierce. In fact, Bill Doolin is thought by many historians to be a sixth member of the gang which hit Coffeyville, holding the horses in the alley, and the only member to have escaped. Bill Dalton also joined the former members of the gang, and they would terrorize the Territories for several years as the infamous Dalton-Doolin Gang. George “Bitter Creek” Newcomb met a 15-year-old girl named Rosa Dunn, known as “The Rose of Cimarron.” Eventually, he sought refuge at her parents’ ranch, and her brothers turned him in for the $5,000 reward on his head. He was shot by U.S. Deputy Marshals on May 2, 1894 in Oklahoma. Charlie” Pierce was with George “Bitter Creek” Newcomb and was also killed by U.S. Deputy Marshals on May 2, 1894, in Oklahoma. Bill Doolin was killed on August 1896 by U.S. Deputy Marshal Heck Thomas near Lawson, Oklahoma. 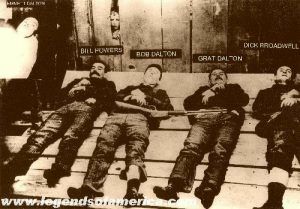 Bill Dalton went on the run after robbing the First National Bank in Longview, Texas and was killed by lawman, Loss Hart, at Elk, Oklahoma on June 7, 1894. “Blackface Charlie” Bryant was arrested by U.S. Deputy Marshal Edward Short in the summer of 1891 and while he was being transported to the federal court in Wichita, Kansas, on August 3, 1891, Bryant stole a gun and shot Marshal Short. The lawman returned fire and when the smoke cleared both men were dead. Who is your 5x Great-Grandmother? The Dalton’s are my cousins 5x removed, I have built my extensive tree on Ancestry as well as received my DNA to confirm. So, if this is the case, we will be long-long-long distant relatives of each other. I’m curious to know the name so I can then look on my tree!